Hey gang! I'll start off by saying this is not a sponsored or affiliate post - I've not been asked to review or paid for this, it's something I won and wanted to share with you all (however, I am PR friendly for cruelty-free and vegan products, so hit me up)! So back in December I entered a twitter competition being held by Kerry aka Ladyzenblogger and a company I hadn't heard of before - Apple and Bears. 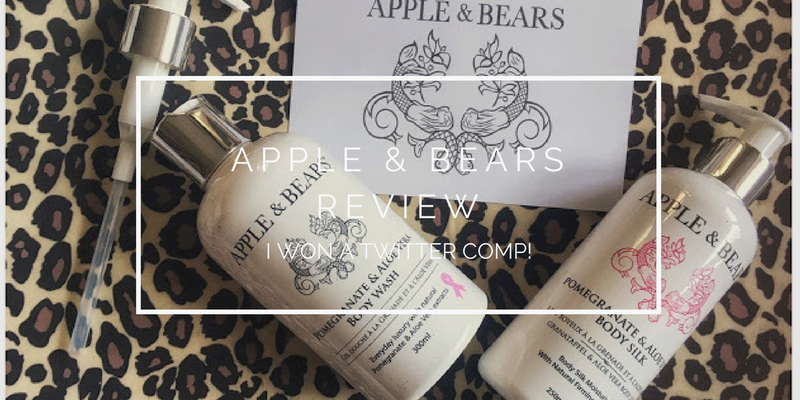 I had a little look on their website and was pleased to see "Apple & Bears is a family operated company producing a range of luxury organic cosmetics which are manufactured wholly in the in the UK." They have strong ethical values and donate 5% (including VAT) from each bottle to Breast Cancer Care. To read more about them and their ethics here's their about us page. I also messaged Apple and Bears as I wanted to check if the products were vegan and received this response "The gift set you have won is the Pomegranate & AloeVera which is suitable for vegans. The only one in the range which is not suitable is the Honey & Hemp." Which is great for me - it's a shame on the Honey & Hemp front as I love the Body Shop's hemp products. Anyway, I entered the competition - I believe it was a "follow both accounts and RT this tweet" basic competition, I never win anything so was totally shocked to win. They posted it out and I received it just before Christmas! Perfect. I had won the Pomegranate & Aloe Vera Luxury Gift Set (RRP £34.95). It arrived in a cute little box (handmade according to their website) which contained the Pomegranate & Aloe Versa Body Wash and matching Body Silk, with a spare pump thing. The body wash lathers up beautifully - a little goes a long way and I can see this lasting me a good year (I still have a whole giant bottle of Lush Snow Fairy from Christmas 2016, unopened). It smells fresh and left my skin feeling quite soft. I often forget to moisturise after showering, but, I've had really dry elbows lately so for a few weeks now I've been using the body silk on my arms and elbows daily and it's made all of the difference. It's no Lush Dream Cream, but it is pretty great! I would absolutely love to try some of their other products once I've caught up on bills after only working very part-time hours for a few months and catching up in January. Luckily - they sent me a little congratulation note confirming some of their ethics and practices, with a cheeky discount code which I hope they won't mind me sharing with you all! Have you tried Apple & Bears? What did you think? Let me know if you do try anything!